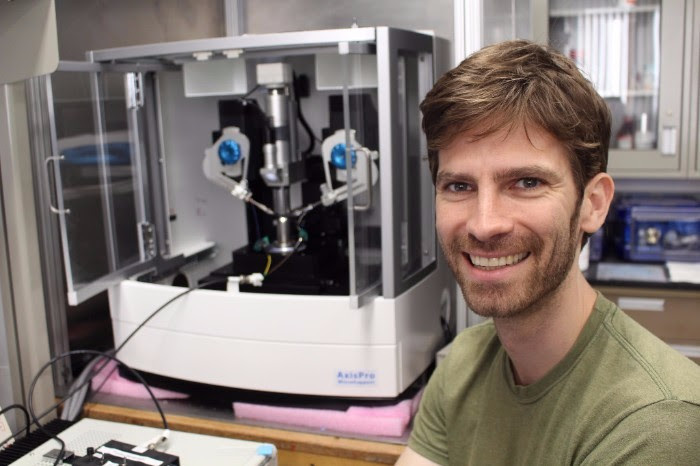 Carnegie Postdoc Zachary Geballe, who has worked on the EFree Electron Transport in Light Element Materials project, has been honored with Carnegie’s seventh Postdoctoral Innovation and Excellence (PIE) Award. These prizes are made through nominations from the departments and are chosen by Carnegie's Office of the President. Zack was awarded the prize for his scientific innovations and service to the Geophysical Laboratory community. Zack has worked on developing methods to measure the heat capacities of metals and silicates at high pressures. This work applies to developing new materials and studying the deep interiors of planets. He developed a pioneering technique to measure heat in a diamond anvil cell (DAC) by using a method called the alternating current 3rd harmonic method. The work was published in two recent papers in the Journal of Applied Physics. Additionally, he devised new, sophisticated sample loading procedures for the DAC with micro-manipulator equipment. The new approach has changed the way the group loads very small samples for high-pressure experiments. Zack was a founding organizer of postdoc-led poster sessions at the BBR campus (see photos and details from 2015, 2016, and 2017), which have featured the work of nearly all the researchers and sparked new collaborations, approaches, and teamwork. Additionally, he is the leader of weekly seminars that feature updates from Carnegie scientists and discussions of high-impact papers from other groups around the world.